So, Arsenal were kind of envious of that Man City Tunnelcam thingy, even if they don’t like to admit it. So much so that they decided to run a secret test. Why was it hidden? Because Arsene was against it, against the invasion of privacy, the trespassing in the Sanctum, the ravishing of the Vestal Virgins. It had been Arsene who had stood in the way of the “Being Arsenal” project. And until very recently he had blocked the Summer tours also. And so, the Arsenal PR department undertook a secret trial. They set up cameras all over the corridors around the dressing rooms, not at the Emirates, because Arsene would have twigged that, but at Cardiff, as a joint exercise with their people. And then they sat back in their chairs to watch the action on the CCTV screens. They picked the wrong day. The buses pull up and the players get off, and our boys are resplendent in their Arsenal suits. So far so good. Arsene himself looked as imperious as the Roman Eagle. There was an expectant buzz about the day. Another chance for Arsenal prove they were for real. And another chance for Cardiff to take a Top 4 scalp. You could feel it. And you could pick it up from the Tunnelcam too. Our PR guys were pumped, smiling back and forwards, high fives to each other as they watched on. It was great TV. Really it wasn’t Arsene’s fault. How do you fill in our teamsheet formation and do it justice. 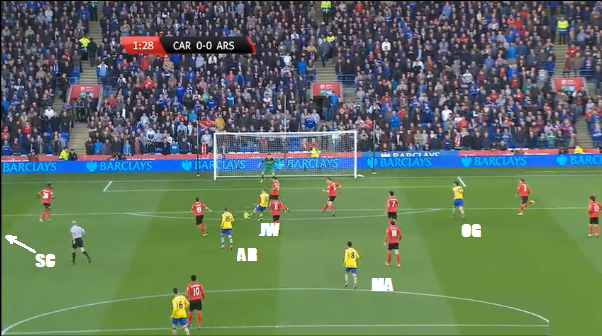 Sure, Arsene does have a tendency to over-complicate things at times, but, come on, 4-2-3-1? Sorry, that would be just a lie. He thought about just giving them names on a teamsheet. But that’s like describing life by listing carbon, oxygen, hydrogen and nitrogen. It does everyone a disservice. 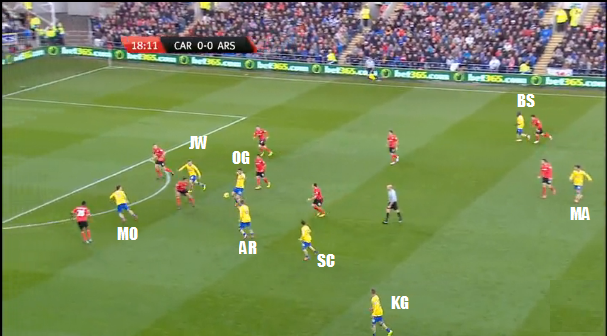 And so Arsene looked to go beyond some names on a sheet or a 4-2-3-1 diagram. He had struggled for some time to come up with a model for his midfield, first to communicate it to his team, and then to communicate to the outside world. He could feel it but he couldn’t describe it. But then one evening at his Gentleman’s club in London he happened to share a glass of sherry with Erwin Schrödinger, the father of Quantum Physics.. And yes, the cat killer. Probably. “It is an embarrassment to Quantum Physics,” Schrödinger continued “. I would not use that piece of paper to clean up the mess after one of my cat experiments. Erwin showed Arsene the diagrams of the orbitals of an electron in a hydrogen atom. 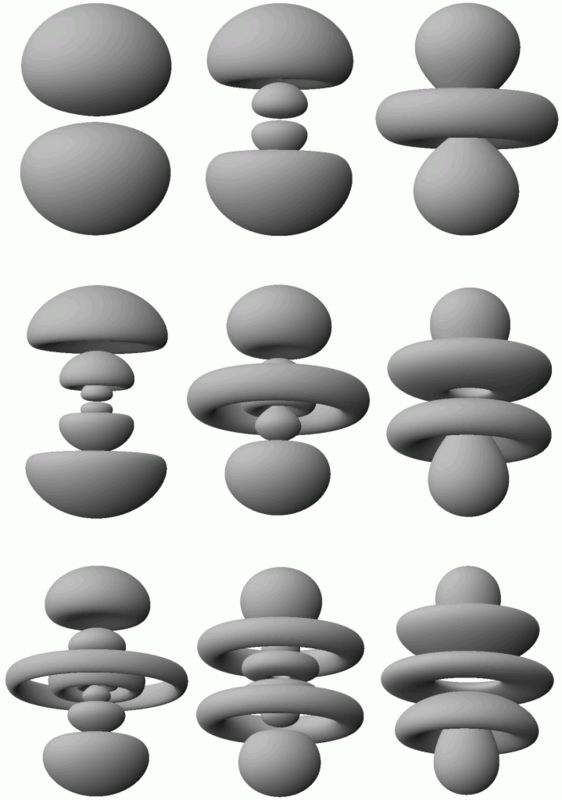 These were the visualizations of the solutions to his “Schrodinger Equation” describing quantum mechanics for subatomic particles. And they were beautiful, worthy of the mysteries of the life force. 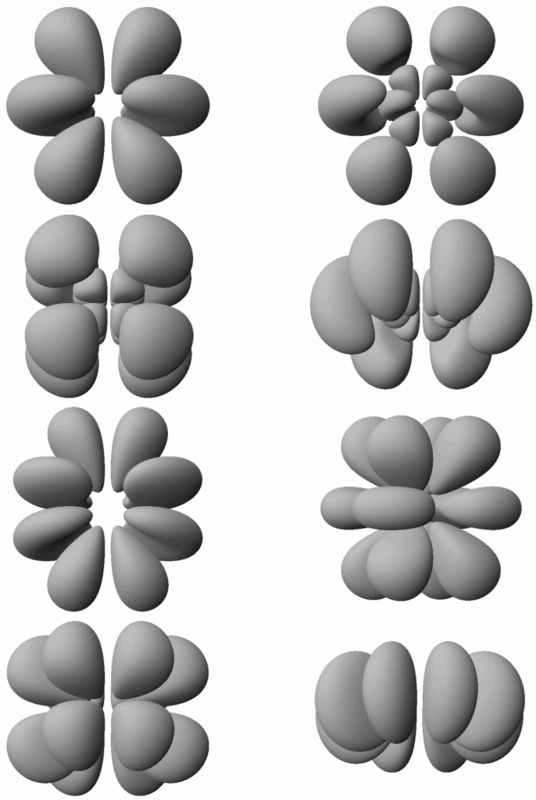 They were probability clouds for the possible paths of an electron orbiting a nucleus. The electron could be anywhere in that cloud. But it was nowhere until it was somewhere, until it was “observed” or until it interacted or collided or until there was an event. Until it was detected in one specific location it was in no specific location probably and every location possibly. Finally, he felt understood. He felt unleashed. Erwin and Arsene swapped diagrams until the early hours that morning. They laughed, they drank, they scribbled. Then a drunken Arsene told Schrödinger that putting an “ö” in his name had now gotten boring and he should change his Twitter handle. Schrödinger protested that he’d never heard of Ozil, and they fought. Then they laughed and drank and scribbled some more. Even more than the Cardiff game, I was blown away by the Marseille game. The front 5 were sublime. They were everywhere and nowhere, as they were against Napoli and as they would be against a very organized Cardiff. Then add in cameo appearances by Sagna, and Monreal or Gibbs. They were a blur, a cloud. They were everywhere and anywhere. You couldn’t predict who would pop up where. The players didn’t take positions. 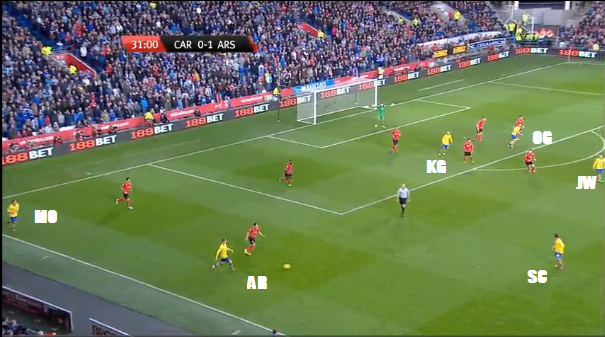 They represented probabilities across the pitch. The 2nd goal vs Marseille, started by some excellent holdup play by OG on the right wing, then a through ball by Ramsey to Ozil who squares it for Jack’s run to the penalty spot. 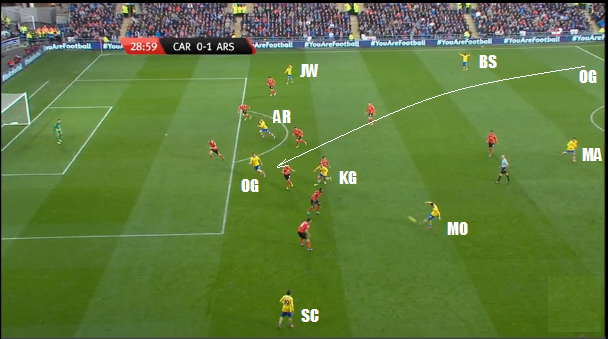 The 1st vs Cardiff started by OG coming deep to the halfway line and pulling the Centerbacks all over the field leaving the space for Ramsey’s Center Forwardesque header. Giroud on the wing. Jack at Center Forward. Jack on the wing with Ozil at Center Forward. Rosicky, Ramsey, Jack, Ozil, Giroud, and at times, Flamini, with Monreal and Sagna dipping in at will…a blur, a cloud. And Cardiff was the same. This time with Santi, Ozil, Jack, Ramsey, Giroud and Arteta and later Flamini who decided he also wanted to play Center Forward for that Jailbreak goal. And remember that first goal against Napoli. Giroud on the wing having dropped back. Ramsey haring up the wing. Ozil charging up the middle. Electrifying. The formation when written down is really a starting position, a first offer, an opening bid. Formations are redundant now. The formation is but a polite suggestion from the manager as to how the players might want to arrange themselves at kick off. But only if they don’t mind. The manager’s only firm rule is “don’t bunch up together too much, lads, if you can help it.” So, as you can see, not that firm a rule. But even that rule was broken. Look at this flashmob moment. Everybody all grouped together in the center of the park for an instant before they scatter. How do you defend that? The possibilities are infinite. No wonder Sir Gary Neville says that his favourite team to watch this year is Arsenal. He’s not wrong. Ironic that Heisenberg is certain he’s uncertain while Hansen is certain he’s certain. So you are saying we are not buying an ST in January, right? But it only became a blog once you clicked on the link. Before then it was both a blog, and not a blog, at the same time. This is very, very good (from someone who has a degree in physics…). Aha! So you’re pulling rank on me, are you?? Glad you enjoyed it mate. Genius Paul.You let your imagination run wild. That is how mind blowing our football can be at times. Anyway, in terms of football jargon, is that what they called “total football”? This is absolutely brilliant! What a fantastic read, and such a thrilling prospect of the type of football we can (hopefully) continue to play through the entire season! Keep it up! The best and funniest blog I have ever read, all your blogs are always worthy the wait. Thank you. Wow. Brilliant and entertaining read. Not sure how you do it. I rated this 5 stars before I read it. The word Schrodinger was enough for me (I love Physics) to get your point. But no matter how well you wrote the fight part, I just cant visualize Mr Wenger throwing punches……. More correctly, it means the more we know about where a player is located on the pitch, the less we know about how fast and in which direction he is about to travel. Or vice versa. Our team this year is really fun to watch , apart from getting results . Very exciting times for gunners everywhere. PS : liking the frequent articles very much . Does this mean that by observing the positions of the players we are changing them? If a match was played behind closed doors they would act differently? Thats a fair point actually.. Pure genius. This is quite possibly one of the best posts I’ve ever read. I remember Martin Jol saying that nobody could figure out how to defend the 2013-2014 Arsenal midfield formation, or non-formation to be more exact. Martin Jol has since been fired by Fulham and enrolled in a 7-year doctoral program at Leiden University in the Quantum Physics division. YES. 4- 1 – Blur. Amazingly well written and original. Bookmarking this. There are a ton of Arsenal blogs out there, but very few with anything quality to add. Mr P.I.M.P, you are lovely! i love physics myself and love this article. I am not a physicist I am actually crap at maths at all levels, so well done. I do really wonder how you come up with these articles and this is a good example. You must have an interest in physics to be able to write like that or did you just research it off the bat? Also you must have an interst cos to even start researching it ‘off the bat’ you would have to know there is something there to use in a story, does that makes sense? Beautiful, well thought out and well presented. Superb effort ! Kinda like our team really. Absolutely enjoyable read. Funny enough I submitted an article to a blog trying to explain to a certain degree the overall objective of this writer, which is that Arsene has introduce another philosophy in football which is the revolving or rotational group of players. This article more or less recognizes that and it’s always a treat to read what you had to say. God does not play dice. A. Einstein. Wengerball is not the result of random formations due to probabilistic happenstance. There are rules to wengerball, subtle, not yet determined but there nevertheless. I really liked it and the metaphor makes sense! Anonymous, electron orbits have some rules too – energy levels have to be conserved and angular momentum too – that’s like Wengerball. Einstein wasted the last 30 years of his life telling Bergkamp not to play as a striker/cf/am/winger/false9/inthehole kind of player until he gave up trying to figure out how and where Dennis would show up on the pitch. Sadly, our zonal marking also follows the uncertainty principle. The ball could be anywhere until it’s observed in the net.